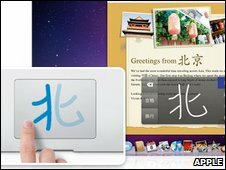 Apple has released the latest version of its operating system, dubbed Snow Leopard. The release is more a series of subtle refinements than a full-on overhaul, according to the firm. Below is a brief list of the changes and additional features that users will notice, as well as tweaks to system performance. 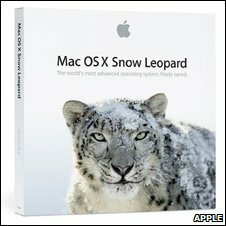 The Snow Leopard release concentrates on simply speeding up and streamlining the whole Mac environment. Apple even says that the installation of the software itself is up to 50% faster than its most recent predecessor. Starting up and shutting down are both about twice as fast, and the back-up service Time Machine is as much as 80% faster. Apple's latest browser Safari 4 (available since June but comes as standard in Snow Leopard) offers faster web browsing. 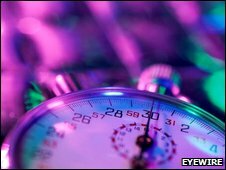 Apple claims that the new version will load HTML pages about three times faster than Firefox 3.5 or Internet Explorer 8. 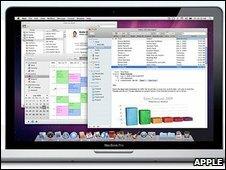 One feature that has been completely overhauled is the Finder, Mac's file management system. Although users will be hard pressed to see the difference, Apple says the revamped Finder is far more responsive. The most visually noticeable changes in Snow Leopard come from tweaks to core OS interface features like Expose (which tiles all open windows on the screen, allowing a choice of which to maximise) and the Dock (the array of icons for launching programs or windows). Expose now fits the open windows to a grid, making it easier to scan through them. By hovering the mouse over an icon on the Dock, Expose will launch, showing all the windows open within that application. Within the Finder, quick previews of PDF and movie files can be viewed just by hovering over their icons. Safari's history can be fully searched, and will now have the "smart" address and search fields that make more sensible suggestions when the start of a web address or search term is entered. The improvements to the QuickTime video application include features once found only in the professional version QuickTime Pro. It can capture video stills and audio clips, and includes buttons to trim video down straight from the viewer. 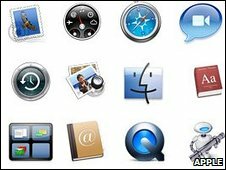 The Mac's chat program iChat has addressed the connection problems that hampered chatting because of router incompatibilities. It also only uses a third of the bandwidth during a chat, and the iChat Theater application - in which users can both view slides or photos during a chat - now has full, 640 x 480 pixel resolution. A number of the refinements have been undertaken to make certain tasks easier or completely automatic. For example, Snow Leopard will automatically determine your location based on a database of known wi-fi hotspots, so as soon as you are in range of one of them, it will update your location and time settings. It automatically searches for printer drivers when a new printer is installed, making printers a plug-and-play peripheral. Selecting text in PDF files can sometimes be difficult when the text is laid out across columns or graphics, and Snow Leopard applies what Apple calls "artificial intelligence" to analyse the layout and determine the text users are likely to be selecting. Users can apply a system-wide "substitution" feature that could, for instance, correct common typos across all applications. For those who have had problems ejecting external media like USB drives, the Ejecting feature should work more smoothly in Snow Leopard. Stripping down the operating system throughout has allowed a lot of excess fat to be trimmed off in terms of the space it occupies. Apple claims that installing Snow Leopard will free up 7GB of disk space, though the actual amount gained seems to differ for each system. One of the invisible but significant changes going on within Snow Leopard is that it is designed specifically for 64-bit hardware, rather than the 32-bit used by many older systems. This change allows programs to communicate and use with the computer's memory more quickly, allowing them to be much more nimble. Depending on how Mac-centric its user is, the biggest new feature in Snow Leopard might be the fact that it's compatible out of the box with Microsoft Exchange, meaning that it can sync easily with Windows networked systems for things like calendars, mail, and contacts. The degree of virus protection in Snow Leopard is as yet unclear; something of an anti-virus program proper would be a first for Apple. In addition to asking if users want to install downloaded programs, it appears to check them for malware against a stored database of known threats.